In celebration of the 2015 National Science and Technology Week (NSTW) comes the soft launching of a one-stop-shop online facility for technologies, S&T experts and related services in the country dubbed as the Network of Experts in Science and Technology (NEST). Spearheaded by the Department of Science and Technology (DOST VI), the program aims to improve the accessibility of S&T experts as well as technologies in the countryside through the development of a web-based information system. “Through NEST, access to experts and technologies particularly by people living outside of the urban centers where most research and technical institutions are located, will improve. NEST will likewise bring the services of any accredited expert located anywhere in the Philippines to clients that need S&T assistance”, exclaimed DOST VI Regional Director Rowen Gelonga. “Being an online service, the use of ICT in the delivery of government programs, projects and services will be enhanced”, he added. Primarily, the program bears the following components: database of S&T experts, consultants and/or subject matter specialists, access to existing technology databases, portal and mobile application software for accessing experts, technologies and services, access to DOST consultancy programs and services, deployment of S&T Development Officers at the provincial level and hosting, cloud Services and ICT support. With the availability of NEST, entrepreneurs, S&T experts, researchers, and employees can take advantage with the consultancy advices and scientific knowledge it offers. 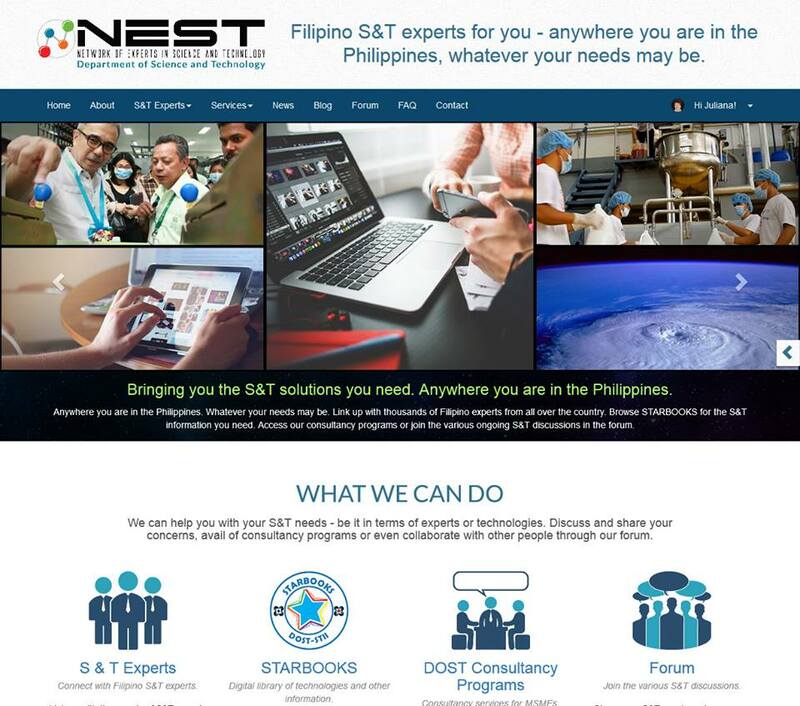 Equally important, the NEST shares common resources with the Science & Technology Academic and Research-Based Openly-Operated Kiosks (STARBOOKS), Philippines’ first digitized S&T library, hence one may search directly for materials on various topics and get results both from NEST and STARBOOKS. The NEST operates within the policy environment of open access, scientific and technological self-reliance and focus towards countryside development and inclusive growth.